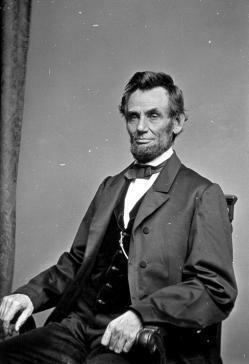 John Witt’s Lincoln’s Code, on Abraham Lincoln and the law of war. Should we thank the Great Emancipator for codifying the law of war—or curse him? Photo courtesy the National Archives and Records Administration. In 1861, the Southern states seceded from the Union. Lincoln and other Northern leaders saw secession as treason and the South’s leaders and soldiers as criminals who should be caught, tried, and hanged. At the same time, to prevent Britain and other foreign countries from trading with the South, Lincoln declared a blockade, which, under the law of war, entitled the U.S. Navy to seize foreign vessels that tried to trade with the South. However, the law of war presumes a conflict between two states. If the law of war applied to the conflict, then Southerners could not be criminals; they were enemy soldiers of a foreign state and thus could be detained for the duration of hostilities but not tried or executed. Thus, for one purpose, the Confederacy was a criminal organization; for another purpose, it was an enemy nation. Lincoln later decided to grant prisoner of war protections to captured enemy soldiers, but only because the South made clear that it would retaliate against captured Union soldiers if the North prosecuted Southerners. Later, after Lincoln’s death, the government again decided to prosecute the leaders of the Confederacy as criminals, but eventually abandoned the effort in response to various political and legal difficulties. Foreign diplomats enjoyed the sight of our moralistic young nation undergoing linguistic gymnastics in order to claim that right always supported its national interest. But larger issues were at stake, and they are the subject of a new book, John Witt’s Lincoln’s Code. It’s worth revisiting these legal conundrums not only because they’re interesting, but also because they take us back to the origins of a codified law of war, and raise still-pertinent questions about the usefulness of having such laws. The law of war has played a central role in debates about American policies toward al-Qaida under Presidents Bush and Obama, with critics frequently arguing that the U.S. government has violated the law of war or improperly cited it as support for its policies. Witt’s historical account helps explain why both administrations felt it necessary to deviate from a strict interpretation of international law. The blockade was hardly the only issue where the Lincoln administration found itself in an awkward position with respect to the law of war. The law of war posed problems when it came to emancipation as well. As Lincoln initially acknowledged, freeing the slaves was probably a violation of the law of war. Slaves were property, and while the law of war permitted armies to seize or destroy enemy property for military objectives, emancipation was different because the property it destroyed was not required for the Union war effort. As Lincoln put it 1861, “If the General needs them [slaves], he can seize them, and use them; but when the need is past, it is not for him to fix their permanent future condition.” Lincoln later shook off these scruples, emancipating the slaves in the Confederacy in 1863. The other great example of law-of-war violations in the Civil War is Sherman’s march through Georgia. Sherman, with Lincoln’s blessing, ordered his troops to live off the land and destroy everything in their path. The general is often credited with (or blamed for) anticipating the “total war” of the 20th century, where the goal was not so much to destroy enemy armies as to undermine public morale and hence political support for the war effort by inflicting misery on innocent civilians. The law of war at the time of the Civil War did not embrace this newfangled form of warfare, and it prohibited the targeting of civilians. But Sherman disregarded the law for the sake of winning the conflict. For many observers, these examples admit of only one conclusion: that Lincoln chose to violate the laws of war when they stood in his way. He did not violate all the rules, but if one gets to pick and choose which rules to obey and which to violate, then the law lacks binding force. The law of war, which at the time was customary rather than embodied in treaties, was not worth the paper it wasn’t written on. Enthusiasts for the way that the Bush administration disregarded or rewrote the law of war to address the threat from Al Qaeda and the Taliban could cite none other than the sainted Lincoln as precedent. Witt believes that this view is too simple. He agrees that Lincoln did not always follow the rules, yet he regards Lincoln as a pragmatist rather than as a criminal. What’s the difference? Witt points out that Lincoln did much to advance the law of war. In 1863, under Lincoln’s authority, a military theorist named Francis Lieber drafted a code of military conduct that became known among international lawyers as the Lieber Code, though Witt prefers to call it Lincoln’s Code, the title of his book. The Lieber Code codified large swaths of the unwritten customary laws of war and modified them where necessary to serve the Union’s immediate war aims—most notably in provisions that authorized belligerents to emancipate slaves owned by persons in enemy countries and that banned discrimination against soldiers on the basis of race. The code was also notable in its insistence that “military necessity” trumped (nearly) all of the substantive rules it contained. So although the Code humanely prohibited belligerents from executing POWs, it also grimly permitted them to do so in the service of “military necessity.” All that was ruled out was private violence or sadistic cruelty. It is a striking fact that Lincoln promulgated the Lieber Code not just as a purely internal set of rules to maintain discipline within the Union Army, but also asserted that it reflected international law and demanded that Confederate armies comply with it as well. The South naturally cried foul, arguing that the slave emancipation provision had no roots in the traditional law of war and merely served the Union’s military interests. Nonetheless, the code provided a basis for partial cooperation between the North and South. The South rejected some provisions, but where the belligerents agreed—for example, as to provisions relating to the treatment, parole, and exchange of POWs—they cooperated. The Lieber Code also contributed to the development of the international law of war. Before Lieber, belligerents frequently disagreed over the law of war because no authoritative document embodied it. Scholars sought to codify the law of war in treatises, but they disagreed with each other and the treatises exerted little authority. Lieber, by contrast, presented the traditional law of war—with his own modifications—in a way that gained not only the approval of the United States government, but also the favor of foreign governments, which soon created their own versions of it. Lieber’s Code and its successors influenced the negotiations that produced formal law-of-war treaties at the Hague and Geneva at the end of the 19th century and in the 20th. For this reason, some people believe that the law of war is meaningless verbiage, propaganda that nations honor in the breach. Countries either disregard the laws altogether or comply with them only when they happen to converge with their military goals. Witt spends a lot of time trying to debunk this view, and he is surely right that the law of war mattered in the Civil War. The Union and Confederacy generally refrained from slaughtering POWs (although prison conditions were extremely harsh) and even managed to exchange prisoners from time to time. But in some places he goes too far. He says that Sherman’s march obeyed the law of war, albeit not the supposedly rigid “Enlightenment model of war” but the pleasingly flexible Lieber Code, which gave pride of place to that squishy concept of military necessity. This comes dangerously close to saying that Sherman obeyed the law of war because the law of war permitted him to do anything he wanted to do. And if that is true, then the Lieber Code was meaningless verbiage after all. Other commentators who have written in defense of the law of war—including many international lawyers—believe that it acts as an external constraint on states, and a constraint based on a common morality rather than expedience or self-interest. This constraint serves a moral purpose by limiting the destructiveness of war. In this view, a belligerent will refrain from executing POWs or bombarding towns even when doing so would advance a military purpose because it is morally wrong. Another, more pragmatic, view is that the law of war serves as a source of focal points for mutual cooperation between belligerents, who comply only with those rules that serve their joint interests. For example, a belligerent might believe that it gains an advantage by executing POWs—but not if the other side executes prisoners as well. The best outcome for both sides is to refrain from executing POWs, so both do. States normally expect a war to end in a settlement and peace, and they do better by reaching that goal with limited rather than with maximal destruction. The law of war provides a framework for keeping destruction to a minimum. Witt is not as clear about where he stands in this debate as he could be. The pragmatic view makes the best sense of his narrative of the Civil War, and he occasionally acknowledges it, but he also argues for the moral-constraint view. He writes, “If the law of war were nothing but the condensed interests of particular constituencies at particular moments, it would not do the work that so many have invested in it.” But the law of war can serve the interests of particular constituencies at particular moments and “work” to the extent that constituencies on both sides of a war have interests that converge. This happens from time to time—during World War II, countries refrained from using chemical weapons both because they feared retaliation and were uncertain as to its practical value. In the end, only the pragmatic understanding of the law of war avoids a supposed paradox that Witt makes much of: If the goal of the war justifies the deaths of hundreds of thousands of one’s own soldiers, why doesn’t it also justify a few law of war violations that improve your chances of victory? Witt, citing President Obama, argues that a country must approach war with humility about its war aims, recognizing that they could be false and therefore harsh means could be unjustified. But this makes little sense from the standpoint of moral psychology or politics. The pragmatic view holds that complying with the law of war does not diminish the probability of prevailing in war. If it doesn’t diminish your chances of winning, while at the same time minimizing destruction for both sides on the way to an eventual settlement, the law of war is not inconsistent with a call to national sacrifice. Still, if some of the conclusions Witt draws are muddled—he has a weakness for adverting to abstractions, like his repeated claim that the Lieber Code balances “justice with humility,” at just those points when precision is demanded—this book will please Civil War buffs, legal and military historians, and international lawyers alike. Witt’s research on letters, drafts, and other documents written by Lieber and the other major figures is impressive, and he presents it lucidly, fairly, and comprehensively, enabling the reader to draw his own conclusions. The only weak portion of the book is the epilogue, where Lincoln’s saintly aura finally defeats Witt, and the Lieber Code ends up being a Monument to Human Progress, another gift to humanity handed down to us from the Great Emancipator. This is a questionable judgment at best in light of the extraordinary depredations that would take place during the wars of the 20th century. By contrast, during the Cold War both the United States and the Soviet Union threatened to hurl nuclear bombs at each other’s cities if attacked. Incinerating millions of innocent civilians is as obvious a law of war violation as there could be. If the threat of mutually assured destruction kept the peace for so long, what are we to make of the rules that supposedly prohibit it?